Once again a team at Hitch tops the Monthly Scoreboard, though this time it's the new owners of the Highest Score All-Time at Hitch, the Trusty Rumpets feat. The Good Folks at Laramie Cigarettes. They put up 206.5 points on the first day of August, becoming the first team at Hitch to cross the 200 point barrier! Two teams at Hitch are on the August Monthly Scoreboard, four at Lou Dawg's, and four at Cardinal Rule. Six of the Monthly Scoreboards Top Ten numbers took place over our first week of Trivia Club in August, representing a very successful first three days of the month. The Electric Mayhem grabbed the top score at Cardinal Rule for the month of August, doing so on the last day of the month! It broke a twenty five week long VHSless streak for the All-Time team, but also netted them an unprecedented thirteenth Sesquicentennial Mark, thanks to 165 points on the night. The top score at Lou Dawg's belongs to The Big Floppy Disks on the 23rd of August! It was a team high night, as well as being the fifth highest score in the history of Lou Dawg's behind four marks set by The Bastards! 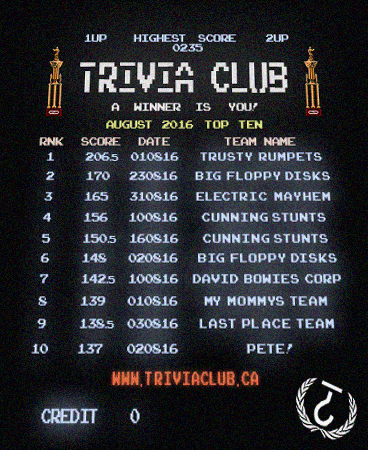 The Big Floppy Disks and the Cunning Stunts both appear on the Monthly Scoreboard for August twice, with the Cunning Stunts having the highest score NOT on the Top Ten with their runner-up score on the last day of August, their 114 points, being good enough for the 11th highest score! David Bowie's Corporate Whores are the highest scoring team of the month not to win a Golden VHS on the night, falling thirteen and a half points behind the Cunning Stunts. The Cunning Stunts make their fifth consecutive appearance on the Monthly Scoreboard, while PETE! makes his third consecutive appearance, and Last Place Team also make a repeat appearance from last months Scoreboard. After a tough July 2016 for High Scoring, August brought the points back in a big way! The 124 points which were enough for first in July would not have even made the Top Ten but would have at least been high enough for the 11th highest score! The Mean Team for August, the high score closest to the scoreboard average, are the Cunning Stunts!